Congratulations to Nhat on passing her DPhil viva on November 27! Nhat started working at OUCRU in the summer of 2012, enrolled in Oxford’s DPhil program in October 2013, and has been working on several major questions in influenza seroepidemiology since then. Nhat analyzed a collection of >20,000 antibody titers from the general population in southern Vietnam. Nhat introduced a standardization technique for the titer calculations, a classification method for the continuous titer measurements, and a model for analyzing the titer set as a time series. The first two chapters of Nhat’s thesis were published here, and the main result from the last chapter will be presented at the Epidemics 6 conference this week. 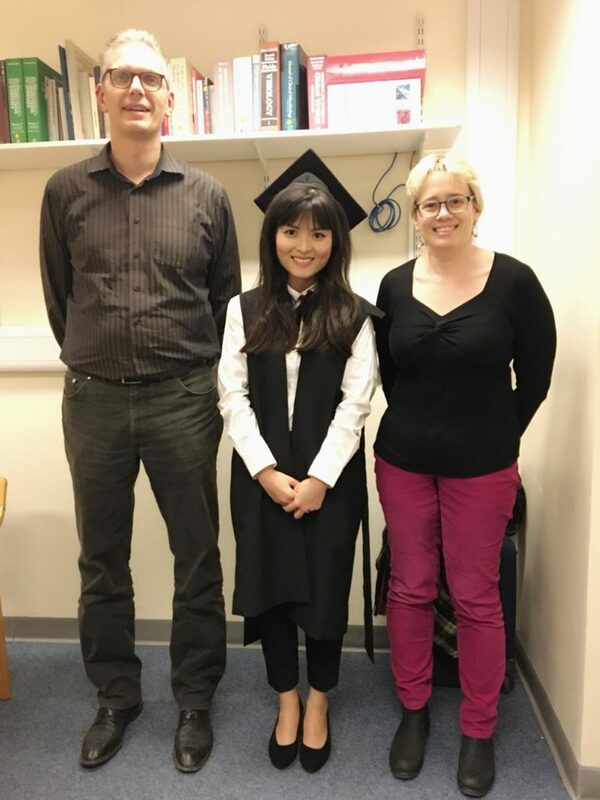 Above, Nhat is pictured after her viva with two external examiners, Prof Niel Hens from the University of Hasselt and Prof Sarah Walker from the University of Oxford. Photo is to scale. Nhat’s thesis was titled Stationary and temporal structure of antibody titer distributions to human influenza A viruses in southern Vietnam.